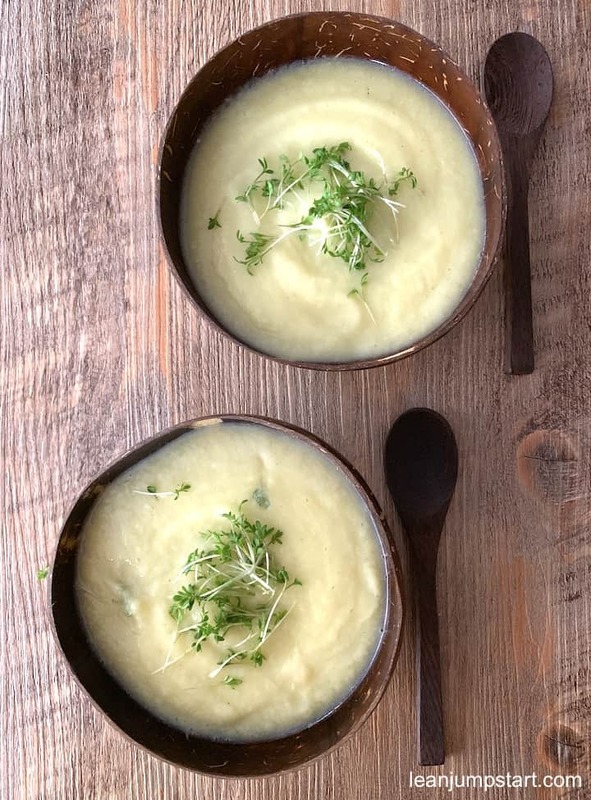 If you are a soup enthusiast like me, you’ll love my delicious kohlrabi celeriac soup. It is so easy to prepare and it can be perfectly served as the main dish due to its high fiber content. By the way, if you need to drop some pounds, this fitness soup could be a great alternative to the famous cabbage soup. 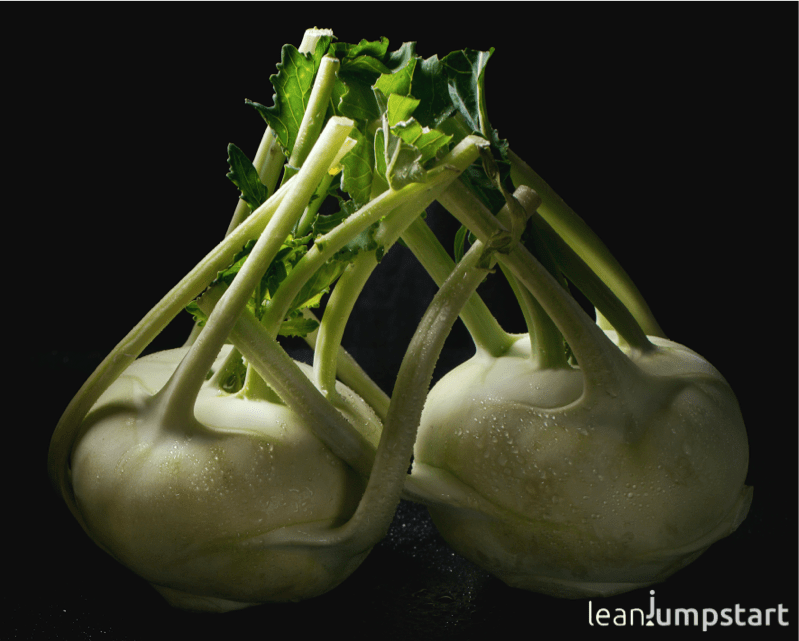 Both kohlrabi and celeriac have diuretic properties and can help to eliminate excess fluid. 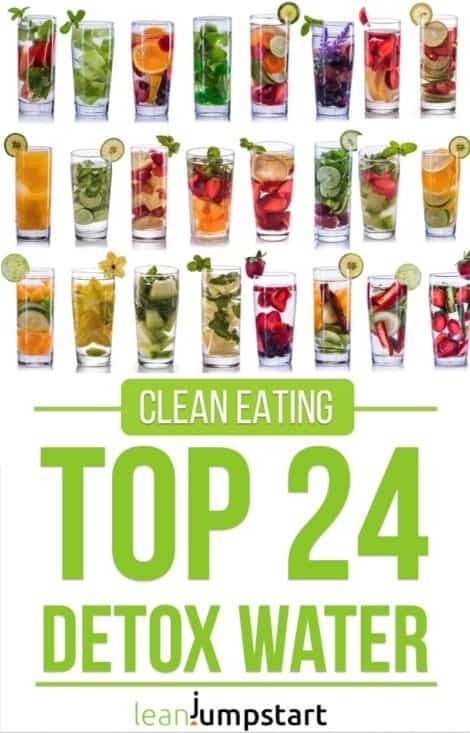 On top of that celeriac can control the cravings for sweet treats. But there might be a problem! Even if you are a soup connoisseur you might scratch your head when you hear the word “Kohlrabi”, especially if you live in the US. And even celeriac is not known to everybody. So let’s first take a look at the two main ingredients. Kohlrabi, also known as cabbage turnip, is like broccoli or cauliflower, also a member of the cabbage family. When raw, it tastes sweet and mild, like a mix between radish and broccoli stem. Common varieties are pale green and purple bulbs with a creamy white interior. In Germany, the pale green versions are dominating and you get them even at Aldi in autumn and winter. I and my daughter love to eat it as a raw snack in between. Kohlrabi is not only a good source of fiber but it contains also vitamin B6, C, and potassium with just 36 calories per cup. Similar to cabbage it is super versatile and there are tons of uses for this slimming cruciferous vegetable. The other phytochemical powerhouse in this creamy soup recipe is celeriac. It is also known as celery root and in the US not so common as celery. Celeriac and celery are very closely related botanically as they derive from the same plant. Although both have the taste of celery, many people find celeriac to be more intense and earthier. Celeriac is a perfect ingredient for soups and stews, like most root vegetables. I have always a knob sitting in my pantry to be added to my Saturday soups or shredded into a raw salad or wok recipe. 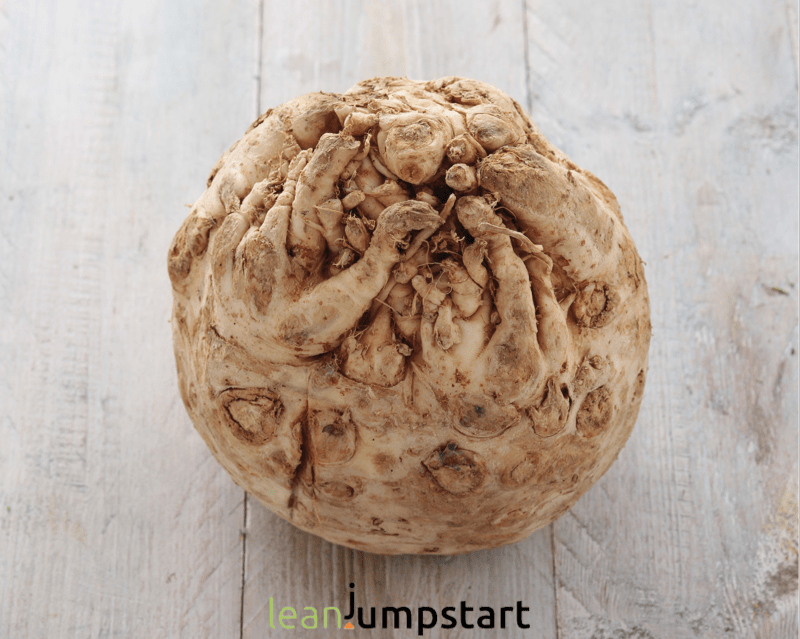 Where to get cabbage turnip and celeriac? 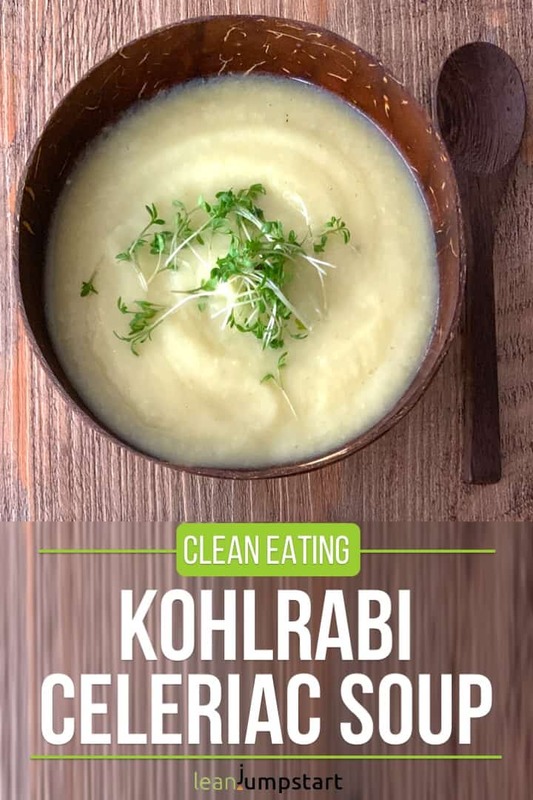 My readers from the US told me that kohlrabi and celeriac can be found in the produce section of Whole Foods Market, Walmart or on Farmers Markets. 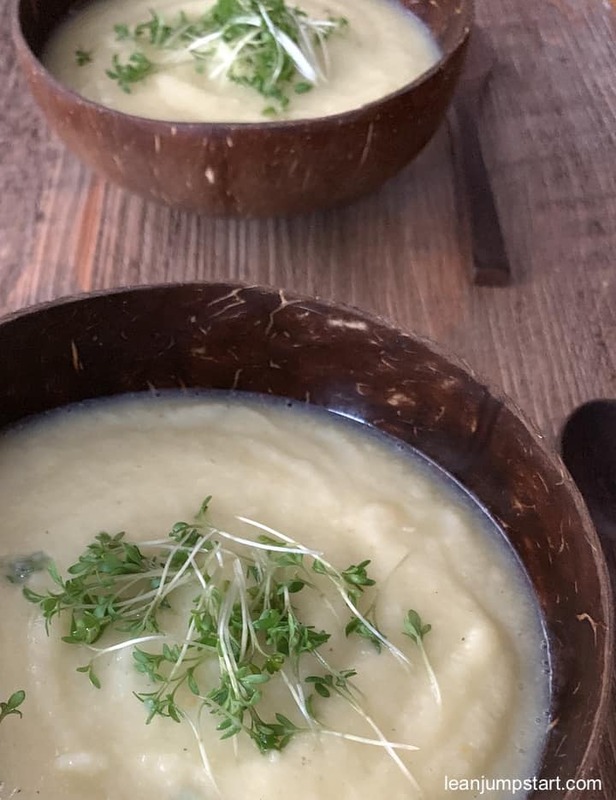 But before you think you should ditch this creamy soup recipe because you can’t get Kohlrabi in your region, you might want to replace it with jicama bulbs or turnips. You could also easily replace it with fennel and create a delicious celeriac fennel soup. If you can’t get celeriac you can use of course celery stalks instead, although the soup flavor will be less aromatic. Check out below for the easy vegan soup recipe. Add kohlrabi cubes, celeriac cubes, and leek rings. Let it sautée for 2 minutes. Bring it to a boil and let it simmer for 20 minutes. Add milk and purée until smooth. Keep it hot and add some liquid for your perfect consistency. Taste with salt, pepper, and nutmeg. Garnish with parsley or garden cress. Serve this creamy soup with slices of whole grain bread! To save time you can prepare the kohlrabi celery soup in advance in batches and freeze it or take it with you to the office. Another great thing about kohlrabi and celeriac is, that you can store both for long periods in your fridge. Kohlrabi: Remove the leaves, place it inside a plastic bag to keep its humidity and store it in the vegetable crisper drawer of your fridge for up to 2 to 3 months! Turnip cabbage with the leaves attached will still keep fresh in your fridge for up to 2 weeks. Celeriac: In the fridge, it will last up to several weeks if kept loosely wrapped in plastic. Both vegetables store well and for an amazingly long time if they are kept cool and dark in your pantry. You gave some very helpful information and picture about Kohlrabi but what the devil is celeriac? and do you have a picture of this, please. It seems to be another word for “knob celery”, a variety of celery, cultivated for its edible roots. Sorry, I didn’t have a clue that it is not a common expression. While their appearances are wildly different, celery root and celery are very closely related botanically. Many people find celeriac to be more intense in taste and earthier. I will try to include a celeriac photo as soon as I can. just a quick note that I have updated this post and included a picture of celeriac including some background information.